The Linksys Powerline HomePlug AV2 Kit contains a pair of no-frills adapters that turn your home powerlines into a fast and reliable network. Unlike the Netgear Powerline 500 WiFi Access Point or the Devolo dLAN 500 WiFi Network Kit, the Linksys Powerline HomePlug AV2 Kit doesn't include a Wi-Fi access point, so you can't use it to boost your Wi-Fi signal straight out of the box. 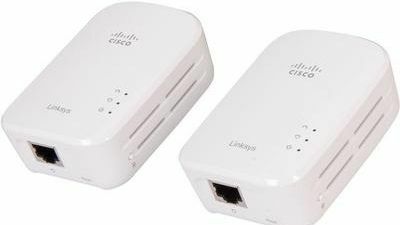 Of course, if you have a spare wireless router lying around you can always connect it to one of the adapters via Ethernet to turn it into a new access point. It also doesn't feature a power socket pass-through or filtering like the Devolo dLAN 500 AVplus. This is a kit that is designed solely to create a powerline network in your home for a reasonable price. Each adapter comes with one Ethernet socket, so you can only attach one wired device at a time, so if you have more than one device you want to connect, you'll want to look at adapters that have more than one Ethernet port, such as the Devolo dLAN 500 AVtriple+. If you want a simple powerline setup, however, then the Linksys Powerline HomePlug AV2 Kit will do just fine. It's designed to be fast and reliable, and uses the latest HomePlug AV2 standard, which can reach a theoretical maximum network speed of 1.5Gbps. However, the Linksys Powerline HomePlug AV2 Kit is capped at 500Mbps, which is a shame as it means it's not using the new technology to its full potential. Set up was very easy; we were able to just plug in the two adapters and they located each other straight away. Each adapter is small and easy to fit into a standard plug socket, and the kit comes with two Ethernet cables. On the adapter there are LEDs that let you know the status and health of the powerline network, which makes installation and configuration much easier. A button on the side of the adapter lets you add security to your powerline network, which is useful if you live in a flat that shares the same power lines as other apartments. In our tests we got network speeds of up to 107.28Mbps, which is a lot faster than the Netgear Powerline 500 WiFi Access Point, though a long way off what AV2 is capable of. For a simple and easy-to-use way of getting a powerline network running in your house, the Linksys Powerline HomePlug AV2 Kit PLEK500 is a fine choice. Though speeds weren't the fastest, there is plenty of bandwidth for streaming films and accessing the internet throughout your home. It's just a shame that even with the brand new AV2 technology, it hasn't been designed to take advantage of it.